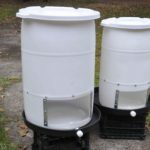 OurWorm Barrels – Our specially designed, handcrafted 35- and 55-gallon worm barrels are for the home, garden or farm vermiculturist and are constructed of heavy duty polypropolene plastic. 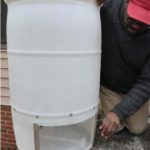 Each barrel features a drainage pan with spigot, an upper composting chamber, a lower harvesting chamber with Plexiglass door, and inner and outer lids. They are appropriate for use outdoors, in a shed, garage or basement. 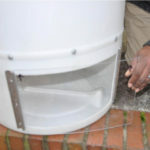 Since vermicomposting produces little odor, they are even appropriate for use inside the home, for example in an entry way or utility room. They do best in cool, well shaded, and temperate environments. They are durable and meant for years of use, and are pest resistant. Red wigglers compost best when temperatures are in the 55° to 85° F range. Extremes of sustained plus-90° or below-32° temperatures will be fatal to your worms. In cold weather the barrels may be insulated to better withstand freezing temperatures. 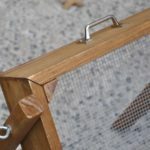 OurCompost Screens – Our wooden composting screens are handmade of the finest materials and are based on our own design. They are 2′ x 3′ (large) and 16″ x 24″ (small). 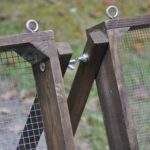 They feature mesh of 1/2″, 1/4″ or 1/8″ inch galvanized screen. 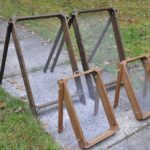 They feature legs for stand-alone vertical use, or can be hung horizontally with rope. 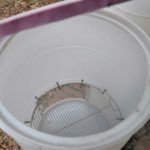 They feature all galvanized and stainless steel parts. I am interested in the large compost screen. Can you tell me the price and if you possibly sell them in Charlotte? Sorry for the very late response, Nnenna. Please see the link at the main menu entitled “Care of Red Wigglers and Construction of Homemade Worm Bin,” for complete DIY instructions on how to easily and cheaply start your way in vermicomposting!